Hetu ei i aye oku. Notes: This happens to be true. I know quite a few folks who will run the other way if they hear a bee. I’ve never understood it myself. Perhaps this is because I’ve never been stung by a bee. By the same token, though, I could never imagine being stung by a bee. I mean, an honest to goodness bee stinging me?! It sounds about as awful as getting into a car accident! I mean, sure, it may happen, but one should probably try one’s best to avoid it if one can—for the entirety of one’s life. But, yeah, I’ve got nothing against bees. I don’t like their honey, and they don’t like to sting me. We have a fine understanding. illaniþ is another clause-level modifier, and an il-word, meaning it has something to do with sequential time. In this case, the -aniþ part is related to the stem -ān- “one”. illaniþ refers to the first time, the beginning, the start. mucún (noun): purple, purple-colored; purple dye; Aurelian. The word mucún originally meant ‘Aurelian’ (the Proto-Eolic root likely had the meaning ‘black-haired’ or ‘dark-haired’), and only came to be used for the color purple metonymically, as purple dyes used to color cloth in Eoleon were, for the most part, imported from Aurelia. I don't know about having the letters G and L together, but I like that vigla resembles vigilant. In Basque there are words words with LG consonant combinations. Guess I could say they the G and L are in different syllables? The word for white in Finnish is valkoinen, which is similar to the Finnish words for light. In Miresua, my word for white is zulki, which starts like the Basque word, zuri. To be fair to Finnish, I want the Miresua words for light to start with V.
Those are Keli’s two food bowls. 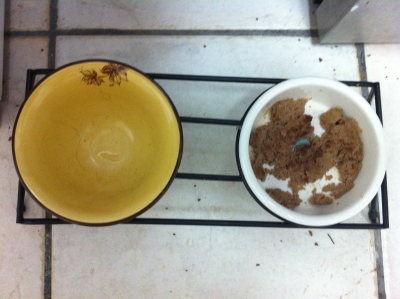 The one on the left is her dry food bowl; the one on the right her wet food bowl. Both bowls had been filled up when I went to sleep. Notice any difference? I’d like to say that it’s a constant battle between Keli and us to get her to eat her wet food, but that’s kind of like saying there’s a constant battle between humans and time: Sure, we “fight” aging with wrinkle creams (or so commercials have led me to believe), but, I mean, come on; we know our place. He did not tell me the reason that he went one day from there along the road to the desert and became lost and alone from the road into the wide desert. Key: Name – Dothraki Word (part of speech) definition. Dave – dave (animate noun) rosemary bush (also an adjective meaning “pungent”). Dan – dan (inanimate noun) ford (i.e. a place where you can cross a river comfortably on horseback). There was already a word based on the stem dan, so I just had to coin a homonym (not much else you can do with “Dan”!). Ryan – rayan (inanimate noun) summit, top, plateau (mainly geological). The stress shifts to the final syllable, of course, but that just makes the word sound more epic, in my opinion. Jon (or perhaps John…?) – jon (adjective) closed, shut, sealed (refers to a seal on a container or something that fits tightly). My friend Jon already claimed the root jan, which is used for jano, the word for “dog”, so I had to go with the spelling rather than the pronunciation here. Rick or Rich – rich (inanimate noun) a bubble or swelling of some kind. I got a lot of mileage out of this root, coining six related words from it. Perry – ferri (inanimate noun, class A, stem fer-) hemp (the material). Sondra (or Sandra…?) – sondra (inanimate noun, class B) obsidian (or what the Valyrians and Westerosi call dragon glass). I was wondering what to do for this word, but your name looks so much like another pattern of words I’ve set up for precious gems and metals, this seemed like kismet. Oh, and by the way: if your name is spelled “Sandra” rather than “Sondra”, it’s not too late to change the word! Gene – jin (animate noun) goat (female). Mapu – mafo (animate noun) young goat, kid. Sierra – siera (animate noun) nephew. Your full name would, in fact, be a licit form in Dothraki, but siera fits a previously-established pattern really, really well, so I dropped one of the rhotics. Janice – janise (animate noun) niece. As with siera, janise (with the -e pronounced at the end) fits a previously-established pattern very well, so I added it on the end. Kim Raymoure – kim (animate noun) ancestor (also an adjective meaning [roughly] “original”). Kim came to all my panels at WorldCon (and the LCS workshop! ), and helped to make my first foray into cons a pleasant one. (It’s so nice to see people in the audience who are interested and not scowling.) In addition to be generally cool, she’s written a book on Linear A, which is about as wild as wild gets. Tim Stoffel – tim (inanimate noun) boot. Tim—known as Hrakkar over at the Dothraki fora—really went above and beyond for my wife and me at WorldCon. We were staying at Circus Circus, which was quite far away from the convention center, and Tim offered to basically shuttle us back and forth the whole time. It saved us a lot of money and a lot of hassle. Tim is also a keeper of big cats, but since I (quite coincidentally) had already coined the Dothraki word for cat (havzi) after the name of his former liger (Hobbes), I felt another word was in order. Leigh Bardugo – lei (animate noun) ghost (also the adjective for “lost”, this is a term for an adult whose body is not burned, and, hence, is not able to ride into the Night Lands). Last, but certainly not least! Leigh bravely ventured forth during my presentation to read a dialogue with me, and did her best to power through an incredibly long Dothraki passage I sprung on her. She’s a good sport (a real lajak), and so I wanted to honor her with a nice, meaty word that will certainly enjoy use at some point in time. Ultimately, the word derives from *leɣi, which one might spell “leghi”, which contains all the letters for Leigh’s name, so she can always know that it was her name this word was coined from (thanks for passing along your card so I could get the spelling right!). Thanks again to everyone who came out to the Dothraki presentation! If all goes well, I hope to be at future WorldCons, and to meet many more who are enthusiastic about language and want to talk conlanging. Uku uila poe fule ti ia i eli. 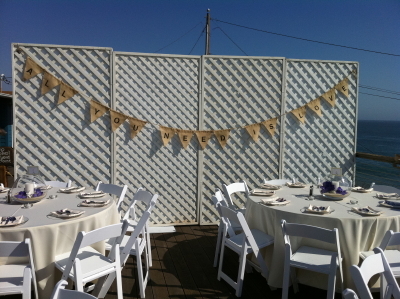 The wedding was held on a dock behind a set of historic cottages (half of which was, I believe, a beachside inn), and as the unused half was open, there was a faux wall put up (the white wall in the photo). It would’ve been rather bare, though, so it was, I think, the groom’s sister that came up with this to drape over it, which I thought was a really nice touch (the two are Beatles’ fans [as are all of us (or as we all should be)]). A couple notes on translation. First, I used the singular “you” there because…well, I needed to decide on one. The nice thing about having a lexeme (in this case, a pronoun) that doesn’t distinguish number is that it doesn’t matter if it’s singular or plural. I’m sure that as far as number and the second person pronoun in English goes, the only thing that ever gets discussed is the drawbacks; rarely do we discuss the advantages. Here I think it works out better in English. As it is in the original, it’s unclear whether John Lennon is singing to one person, a group of people (e.g. the world), or using the generic (i.e. not “all you need is love” but “all one needs is love”). Leaving that unstated works better than stating it specifically—and this ambiguity is impossible in a language like Kamakawi, with number specified on second person pronouns. The translation is more verbose than English (rather unusual for Kamakawi), mainly due to the nature of uila, which isn’t generally used as a noun. As such, it needs to modify something—a dummy noun—which in this case turns out to be uku. One odd quirk of Kamakawi grammar that actually simplifies the translation slightly is the alignment of fule, which is a bit different from ordinary transitive verbs. With fule, the wanter or needer is the object (expressed by ti), and the wanted or needed entity is the subject. Since Kamakawi can only relativize on subjects, the verb in the embedded clause can be rendered ordinarily, rather than in the passive. Oh, as an aside, “All You Need Is Love” is the song that Erin and I walked out to right after we were pronounced husband and wife. He did not say to me how he made a dwelling, nor where. jasōþa means “place: or “location”. sū jasōþa is “at/on a place”. You are currently browsing the Conlangers blog archives for August, 2011.